Building a digital marketing funnel for your online business can be challenging and time consuming. Unfortunately many entrepreneurs don’t ever build a proper sales funnel for their business which means they’re potentially missing out on a lot of sales. Why should you build a sales funnel for your business? 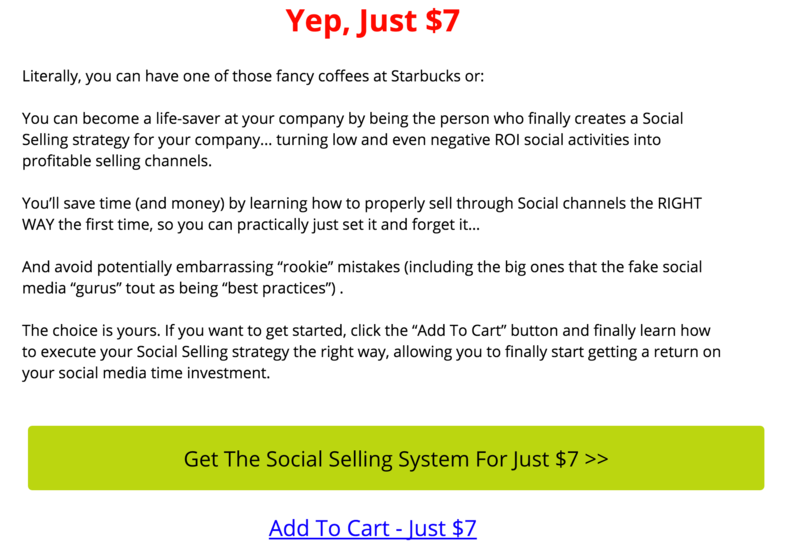 Before I started using this 7-step system, I would create digital marketing funnels haphazardly for myself and my clients, hoping that it would create good results. Although it was much better than not having a sales funnel at all, I started to see better success with my own business and clients once I had a system. 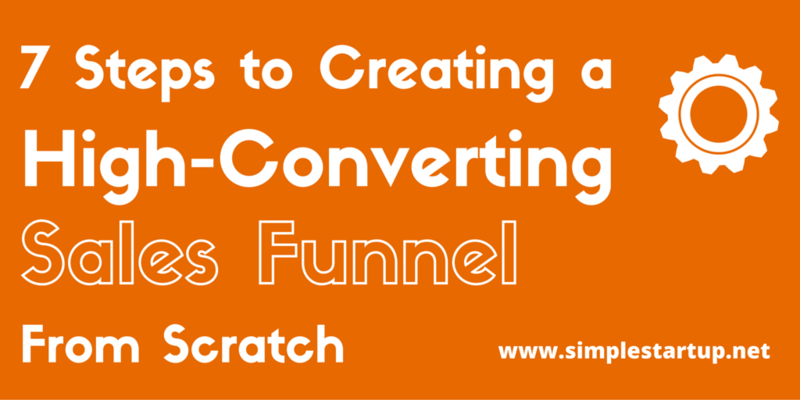 So by following this process, you can skip the trial and error and build a high-converting sales funnel in no time. Before getting into the details about how to setup a high-converting sales funnel, it’s important to understand what exactly a sales funnel is. A digital marketing funnel is the process by which you lead a prospective customer from being a visitor to becoming a raving fan for your business. The first stage is about attracting people into your sales funnel via marketing channels: SEO, Social Media, Paid Ads, etc. 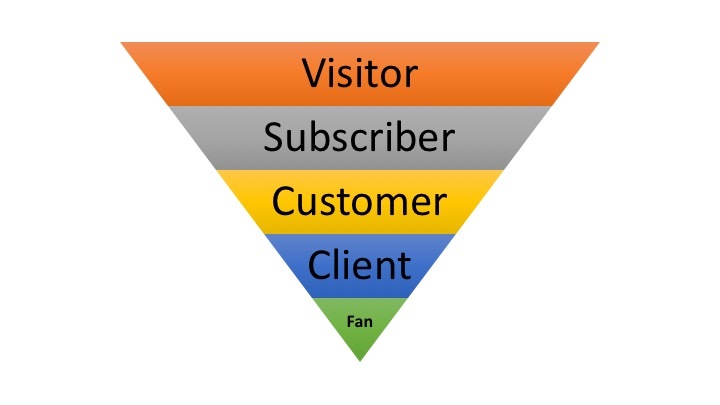 The second stage is about converting the website visitor into a subscriber or lead. The third stage is about converting the subscriber into a customer. The fourth stage is about converting the buyer into a client (repeat customer). The fifth and final stage is about turning your clients into raving fans. In this post, we’re going to discuss the 7 essential elements of a sales funnel (click image to make bigger) that lead a visitor to becoming a raving fan of your business. Place content in front of them in order to drive traffic back to your landing page (traffic). A lot of entrepreneurs start their business by creating products and services without truly understanding who their customers are and this is a big mistake. If you want to truly understand who your customers are, then you need to first create a customer avatar. What’s their biggest fears, frustrations, hopes and aspirations? What’s their biggest need right now? Aspiring entrepreneurs, experts, speakers, and coaches who want to start and grow their business online quickly and efficiently. They fear no one will buy their products and services. They hope they can create a sustainable business around their passion so that they have the freedom to spend more time to travel, pay off their debt and spend more time with family and friends. They’re frustrated that they’re not getting the results they expected from their business when they first started. To start and launch an online business that gets more leads and sales. If you want to attract quality subscribers to your email list, then you need to make sure that the content you’re delivering meets the needs of your visitors. If you don’t yet have a content marketing strategy in place, and are simply relying on paid advertising to drive traffic to your landing pages/homepage, then you’re not most likely not going to see great results from your campaign. A content marketing strategy is about creating content that solves a specific problem for your prospective customer. For example, if you’re targeting people who want to lose weight, then your content would revolve around specific problems that they face every day losing and maintaining weight. Once you’ve identified the needs of your audience (customer avatar), then you can begin creating content. You don’t need to start with all of them. If you start with even one content method, say creating 1 compelling blog post per week that resonates with your audience, then you’ll start to build a strong following. Once you’ve identified the needs of your avatar and have the created content, then it’s time to find a platform to publish to. Keep in mind that the channel you chose depends on your audience. If they primarily hang out on Facebook, then you should use Facebook. If they use Instagram, then use that. 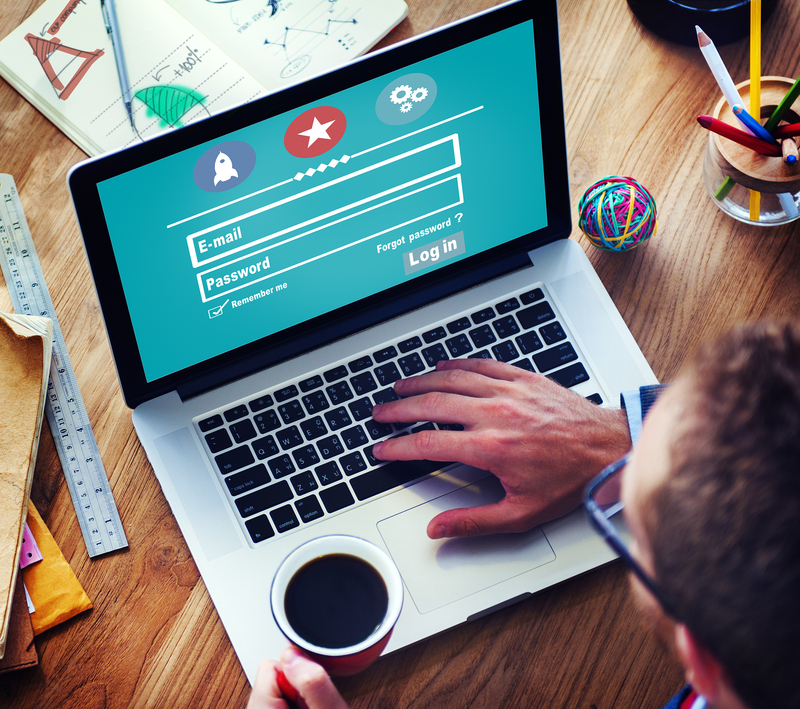 There are several different approaches you can take to driving traffic. Although the free traffic approach is a great way to get started on little to no budget, keep in mind that it still takes a lot of time and effort to start seeing results and traffic. Paid traffic on the other hand can save a lot of time and effort, because you’ll start seeing immediate results. For example, if you create a Facebook Ads campaign for your lead magnet offer, you can start driving traffic to your landing page within hours. SEO on the other hand, can take 3-12 months to see results and traffic (depending on how competitive the keyword is). But the results can also long-lasting, as once you get first page rankings, you don’t have to spend a lot of time and effort maintaining them. Whatever you choose (free or paid), start with one traffic source to start and then you can expand from there once you’ve automated the process. One of the best ways to collect leads and get more subscribers is to offer a lead magnet. A lead magnet is an irresistible offer that you make your website visitors for free in order to collect a name, email address, and sometimes a phone number. He’s offering a “cheat sheet” for writing guest posts that go viral. It’s a compelling lead magnet because it speaks directly to something all bloggers would want — for their blog posts to get traction and go viral. It’s easy to consume and can be downloaded immediately. Just need to fill out an email address. Notice also that it’s very specific. You’re getting “52 Headline Hacks” — not just “Headline hacks”. So keep that in mind when creating a title for your lead magnet. By signing up, you’re also going to get weekly blog traffic tips delivered directly to your inbox. This is good because it’s also specific since you’re getting “blog traffic tips”. Too many marketers make the mistake of using something generic like “get free updates” or “sign up for the newsletter”. Unfortunately it’s not very compelling, and I don’t see any reason to sign up. So when making your offer, make sure to make it highly specific so that your readers are compelled to sign up for it. If you want website visitors to sign up for your lead magnet, then you need to setup a simple, yet effective landing page that speaks directly to your audiences’ problems, fears, hopes and desires. When creating your landing page, try to keep it as simple as possible so that it’s easier for your visitor to digest the information. 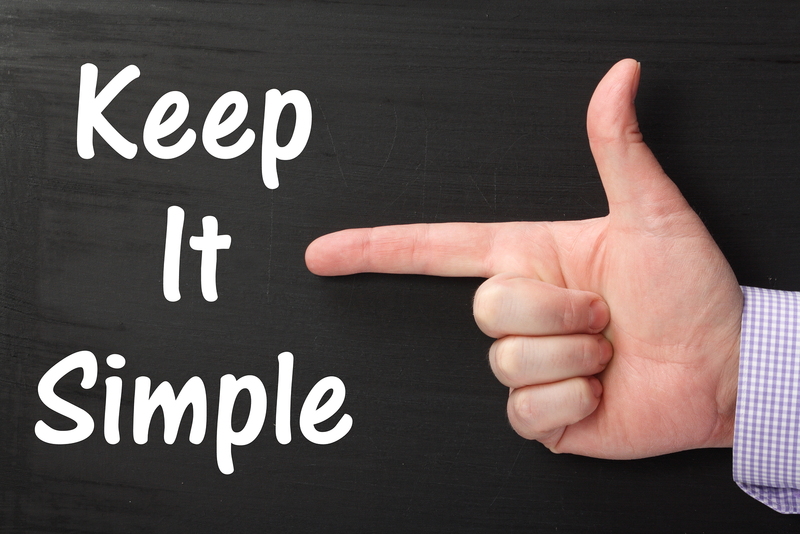 For example, have no more than 3-5 bullet points, one call to action, one promise and one offer. Your headline and subheadline should speak directly to your prospects’ biggest problems and need. It should be clear and concise. It doesn’t get much clearer than this. If you answer these 3 questions on your landing page, you’ll have a have a much greater chance of getting your visitors to take action. A tripwire is a low-end offer — usually $1 – $20 — that you make to your prospects after they have sign up for your lead magnet. The purpose of using a tripwire offer is to convert leads and subscribers into buyers since a buyers list is more valuable than a leads list. A tripwire is usually a part of your “core offer”. It’s good enough to be a stand-alone product, but you can splinter it off your core offer so that it’s relevant. That way people who buy your tripwire offer are much more likely to buy your core offer since it’s the next logical step in the sequence. 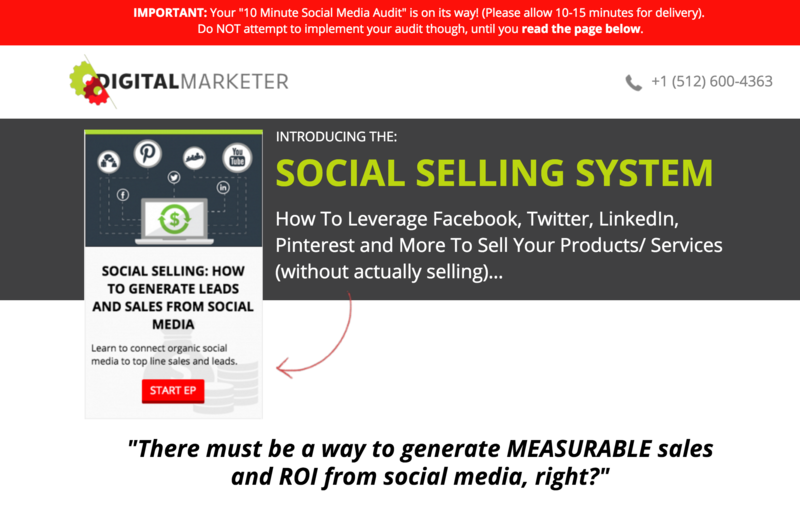 This is the page shown immediately after someone signs up for their “10-Minute Social Media Audit” landing page. Notice the note at the top of the page. It tells them that their audit is on the way and that they should receive it within the next 10-15 minutes. This is important because you want to assure them that they will receive the lead magnet within a short time. The tripwire itself is a “Social Selling System” that shows you how to generate leads and sales from the various social media platforms such as Facebook, Twitter, Linkedin, etc. As you can see this tripwire sells for $7 which falls within the $1 – $20 range. Although this tripwire offer is a stand-alone product (what they refer to as an EP or Execution Plan), it’s also part of a bigger library of courses which you can get if you sign up to their membership site DM Labs (core offer). So keep in mind when creating your tripwire offer, it’s best to splinter off of your core offer to create a stand-alone product or service which you can offer for a low-price so that you start creating a buyers list (rather than just a leads list). Every good marketing campaign begins by having a great core product or service. This is the main event — your flagship course, product, or service — and it’s ultimately what you want your prospective customers to buy. If you don’t have a product or service that people want or need, then it doesn’t matter how much traffic you send to it — it won’t convert. So before you begin promoting your product, you need to make sure that it’s truly what your customers desire. One of the best way to find out if your product or service is in demand is by surveying prospective customers if it’s something they’d be interested in buying. A good core offer starts with knowing what your customers need or want. Profit maximizers are additional products and services you offer your existing customers and clients in order to maximize the profits from your sales funnel. If you don’t yet have any customers then you don’t need to focus on this just as yet. But once you start to get more customers and clients, you can start to create these profit maximizers. If you want to get the most sales possible from your sales funnel, then you’ll need to start offering more products and services. You can accomplish this by offering upsells and crossells when they buy your tripwire or your core product. Upsells are simply more features of the same core product or service. For example, let’s look at LeadPages — a SAAS company that offers landing page and minisite templates for your business. Their core product is the landing page templates and leadboxes. However, if you want to get additional features such as A/B split testing, access to their affiliate program or priority email support, then you have to upgrade to their pro annual plan. For their standard plan, you get 5 features for $25/month on an annual plan. 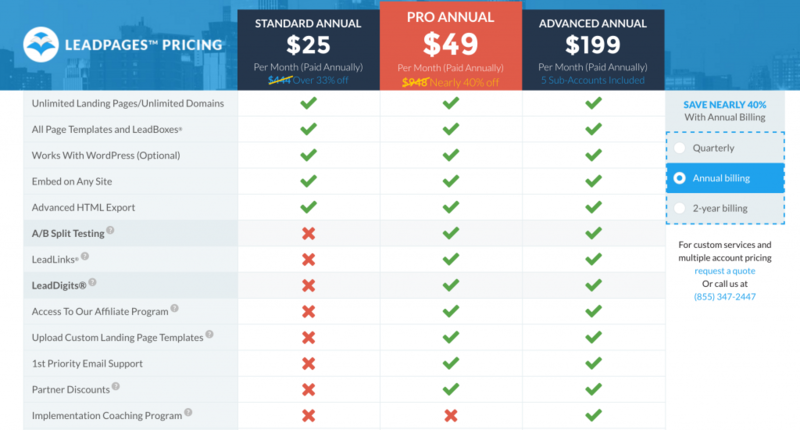 For their pro annual plan you get 7 additional features for $49/month. If you initially join their standard plan, then they will try to upsell you on their pro annual plans when you join their webinar trainings (usually with a few added bonuses as an incentive). Upsells are a great way to maximize your sales. Don’t just offer one core product with the same amount of features. Rather, start to create offers that enhance the core product. If you’re an instructor and your tripwire is a mini-course, your upsell to that could be your flagship course or membership site. A second upsell could be a high-end monthly coaching page. If you’re just starting out, you don’t need multiple upsell offers — one is fine. But as you grow your business, continue to add more products and services as upsells to get more sales. When building your email list, it’s important to follow up with your prospects and buyers. As soon as someone signs up for your lead magnet, you can start sending a sequence of emails consistently each week. What matters most is not how many emails you send, but that you consistently deliver them at the same day each week. Keep in mind that not everyone who signs up to your email list are ready to buy. That’s why it’s important to continue to follow up with your prospects by giving them tons of valuable content — not just pitches for your products and services. What value can you offer in your autoresponder sequences? The key idea is to offer value over time to your subscribers so that they start to know, like and trust you. If you build that rapport by offering valuable content, then they’ll be much more likely buy your products and services when you pitch them. But keep in mind that you should only be pitching them 20% of the time. The other 80% should be free content, surveys, company updates, etc. Personally, I don’t like it when I’m being pitched to every day by marketers. I prefer when they send me free video training, blog post updates, newsletters, podcasts, etc. It keeps me engaged and I spend more time interacting with the person or brand. So when building your email list, make sure to continue to provide 10X value so that you build solid relationships with your subscribers and buyers. Building a sales funnel can be challenging and time consuming. However, if you follow the 7-step sales funnel system, then you will have the elements you need to build a high-converting sales funnel from scratch in no time. Just make sure to focus on one specific step at a time until you have your entire sales funnel setup. Setup Your Autoresponder Sequence for both leads and buyers. This is an amazing detailed post. You made it easy to understand the sales funnel in a way that I have never seen before. Thank you Mayank!